Day one was not really a “day” in the strict sense of the word. We departed Philly at 1 PM Friday on the shuttle to JFK, and flew overnight into Casablanca, arriving about 7:45 AM. We then “hit the road” on our charter motorcoach, arriving at our first night’s lodging about 6 PM Saturday evening, followed by dinner and a post-meal stroll through downtown Fez. So “day” is a little bit of a misnomer.The Casablanca airport is about 20 miles outside of the city itself, so we barely saw anything but the outskirts of that city. What we saw of Casablanca is what I imagine the drive from Philly airport to Center City Philadelphia would look like if you constructed cinder block and poured concrete boxes in endless rows amid all the auto junkyards and oil refineries in South Philadelphia. Pretty bleak. I have been to Jordan, and have seen the Palestinian refugee camps there, and the conditions outside of Casablanca were comparable. Motoring to Rabat heralded a marked change in scenery. Rabat is the present-day capital of Morocco, and is a decidedly more upscale, modern community, populated largely by middle-class civil servants. 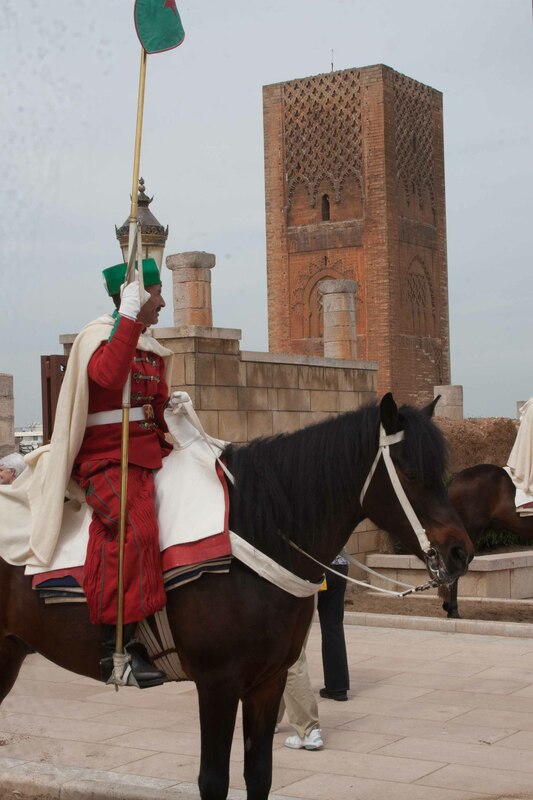 It is also the home of the Royal Palace and office compound for King Mohammed VI. 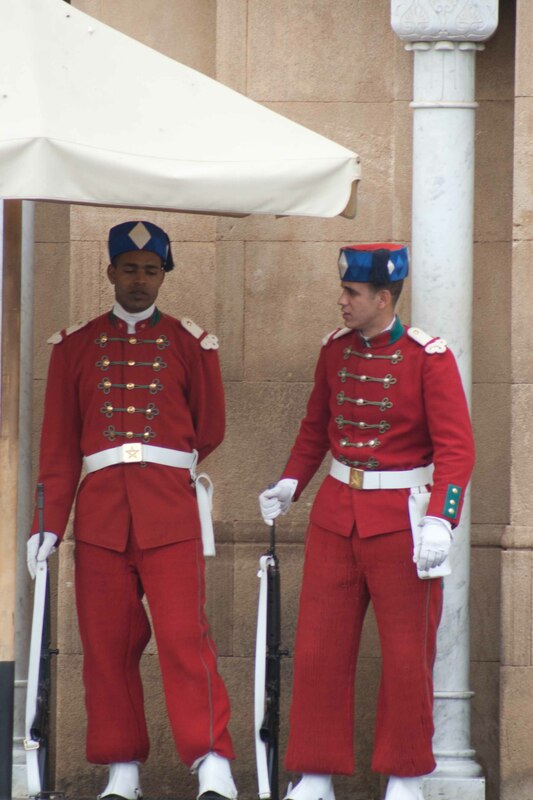 We arrived in time to see the “changing of the guard” at the Palace (rulers love their pomp! ), and then observed (from outside – non-believers are not welcome inside) the mosque where the King prays when he is in the compound. We then had lunch in downtown Rabat, a busy little city with the typically crazy Middle Eastern traffic patterns (or lack thereof). French is the “official” second language of Morocco, and is the principal language for government workers; it is apparently also the second language for waiters (English decidedly is not). We managed to negotiate through the lunch menu after a few false starts, and had an amusing pantomime with our waiter, trying to scrawl out discernable numbers when it came to figuring out what our “vin blanc” really cost in Moroccan dirhams. After lunch it was on to Fez, a two hour bus ride south of Rabat. This ride was a recurring series of small naps, punctuated by brief waking moments of ever more interesting scenery: farmland, vineyards (Morocco has a wine industry, and we are already contributing to its growth), olive groves, a serious jolt at an espresso bar, and finally, through the walls and into Fez, home for the next three nights. 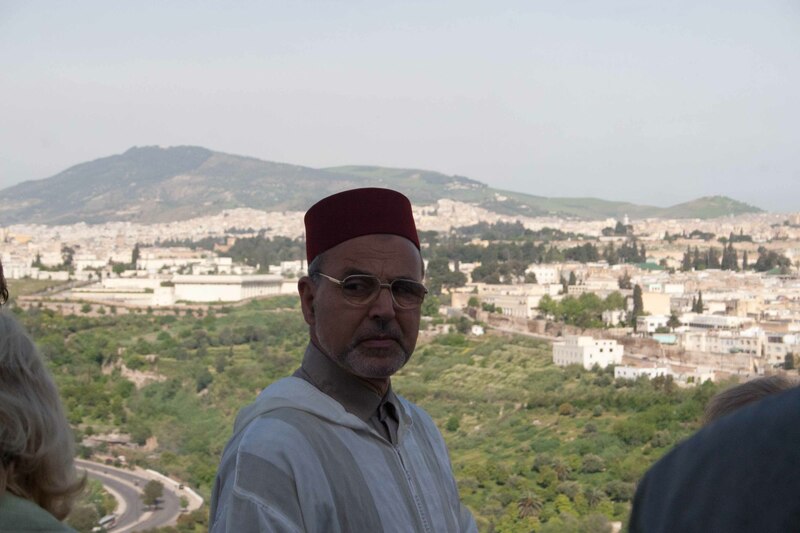 More about Fez tomorrow, when we are visiting the famous tanneries and then entering the medina to visit the souks. Interesting vignette: Fez the city is pronounced “Fess”. Fez the hat is pronounced as written. Fez inhabitants are called Fassi’s. The hats were named after the earliest inhabitants of the city who adopted this very interesting style as their very own. And they still wear them.